Roberto Baggio is one of the most iconic footballers of all time and arguably Italy’s greatest-ever player. He can also easily be cast as soccer’s greatest hippie, owing to that the ‘divine ponytail’ was a player to rank among the greats. As a soccer player Baggio has won two Scudetti, a UEFA Cup, a Ballon d’Or and a World Player of the Year award; he scored 204 goals in 452 Serie A appearances and 27 in 56 internationals. All these accolades tell the world Baggio’s story. Unlike other soccer players interested in fame and making money, Baggio used his name and status for far worthier causes. Not only was he a legendary soccer player but also a fantastic human being. Baggio has received the Man of Peace award from the Nobel Peace Prize Laureates in 2010 and celebrated his half century with the victims of the Amatrice earthquake victims. In 2002, Baggio was nominated as a Goodwill Ambassador of the Food and Agriculture Organization of the United Nations. 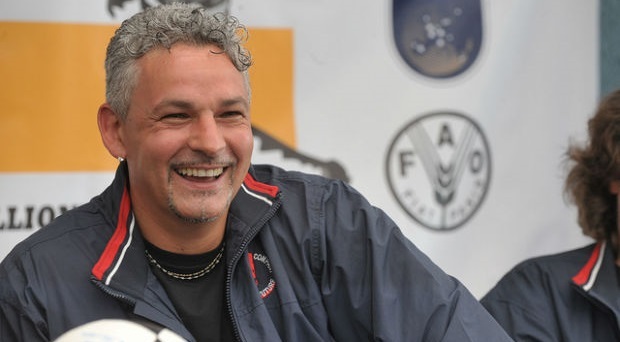 Roberto Baggio was born in 1967 in Caldogno, Italy – the sixth of eight brothers. Baggio began his youth career after being noticed by his hometown youth team, Caldogno, at the age of 9. By the time he had turned 11, he had scored 45 goals and provided 20 assists in 26 matches, and scoring six goals in one match. His talent was recognised by scout Antonio Mora, and he became part of Vicenza at the age of 15. After successful two seasons he was awarded the Guerin d’Oro in 1985 as the Best Player in Serie C. However his big move came three years later in 1985 when got signed on by Fiorentina for £1.5 million. In 1995 Baggio joined Juventus for five seasons and during that period he scored 115 goals for the club in a total of 200 appearances. During his stint with the club, Baggio helped them in winning the UEFA Cup in the year 1993. Soon after his spell at Juventus, Baggio joined AC Milan in 1997. With Milan he won the Serie A in 1995-96. What made Baggio unique was the way he would display the singular geometry of the beautiful game with his skills. Baggio also represented his national team Italy in three consecutive World Cup tournaments from 1990 to 1998 and in 1994 he was instrumental in taking Italy to the final of the World Cup. Baggio has won the Ballon d’Or in 1993, that same year he was FIFA’s World Player of the Year as well. In 1999 he came fourth in the FIFA Player of the Century vote and was chosen in the FIFA World Cup Dream Team in 2002. In 2004, he was named by PELE in the FIFA 100 list of the World’s Greatest Living Players. He came in 16 in World Soccer Awards 100 Greatest Players of the 20th Century. He was also inducted into the AC Milan HALL OF Fame in 2000 and the Italian Hall of Fame in 2011. Baggio was named as Italy’s Player of the Century in 2000.